6900401 B50W YANMAR B50W Wheel excavator. Spare Parts Catalog. Service (workshop) Manual. Operator's Instruction Manual. 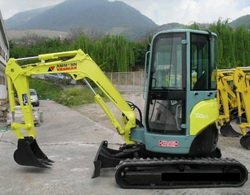 6900402 B50W-1 YANMAR B50W-1 Wheel excavator. Spare Parts Catalog. Service (workshop) Manual. Operator's Instruction Manual. 6900403 B55W YANMAR B55W Wheel excavator. Spare Parts Catalog. Service (workshop) Manual. Operator's Instruction Manual. 6900404 B55W-1 YANMAR B55W-1 Wheel excavator. Spare Parts Catalog. Service (workshop) Manual. Operator's Instruction Manual. 6900405 YB401W YANMAR YB401W Wheel excavator. Spare Parts Catalog. Service (workshop) Manual. Operator's Instruction Manual.